Originally from Nashville, Megan is the Assistant Director as The South Austin Museum of Popular Culture, which is a poster archive with a small gallery space that hosts a number of free concerts throughout the year. 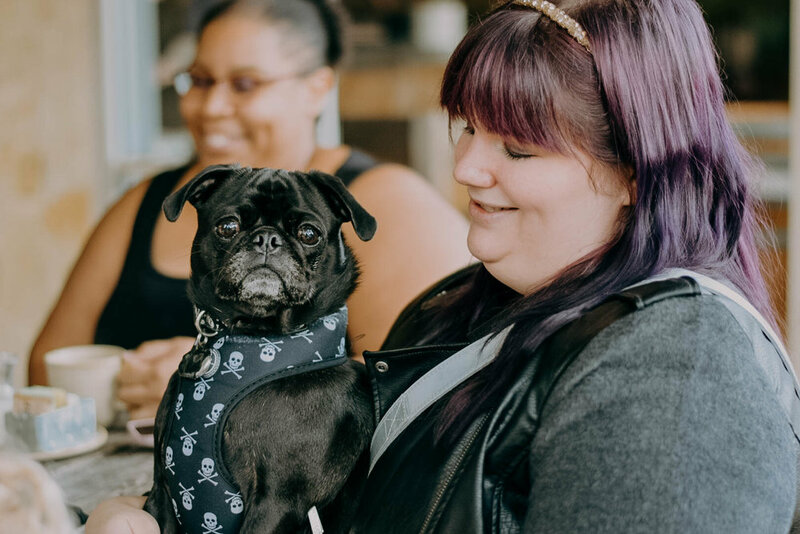 She’s a dog mom to a cutie black pug named Schwartz. While her striking, purple hair or funny t-shirts may be the first thing you notice about her, it’s her perseverance that became most notable for me while working with her. >> And, ultimately, why she was chosen as my January 2019 spotlight. Early on, Megan shared with me that while she’s competitive, she doesn’t have any quit in her— though, she’ll likely complain the whole time (note her t-shirt in the gallery). HA! But seriously, she said that. Megan and I met at a time when life got crazy for her and she was ready to take charge of her health and fitness again. She’d previously been very active between yoga and CrossFit and missed feeling strong and capable. Nowadays, while Megan has kept up appearances with a number of complaints, she does indeed fight for her finish line(s). 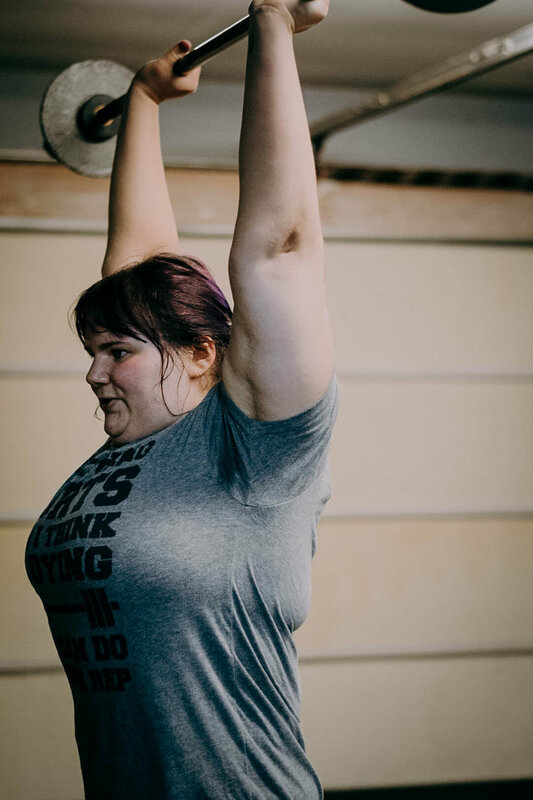 Among her successes, she deadlifted 215# for a 1-Rep Max in December 2018. While it wasn’t a lifetime personal record for her, she was thrilled with the “gainz” she’d made within nine, short months (as was I!) with her core and glutes. She’s also pumped out a sub-2 minute 500-meter row (1:59 to be exact)! In June 2018, just a couple months into training, I received a text from Megan saying that she’d broken her foot while doing yard work that weekend. While she needed to make a few adjustments to her training, never did Megan appear distraught or frustrated about this temporary setback. In fact, she said that she needed to continue working out for the “mood boost”— SCORE! Megan’s sessions had become an outlet for her emotional needs! During those two months or so, we focused on the plethora of things she was still very able to do and away we went building into a healthy routine of sweat and fitness, adjusting and modifying movements to meet her then needs without missing a beat! Rarely ever missing a session, Megan has, IMO, regained some sense of self. She is honing her athletism again, building foundational strength and then some, and is feeling capable and empowered. I cannot wait to see how her future unfolds! Want to learn more about this fun and amazing woman? Keep reading! 10 Things About Megan S.
UPDATE (January 25, 2019): After feeling amiss for a few days earlier in the month, Megan went to her doctor to report her symptoms. She ended up getting admitted to the hospital later that week for emergency surgery. While our training hit another snag, I received the following text from her. Keep on fighting the good fight. It’s been an absolute pleasure working with you, Megan!